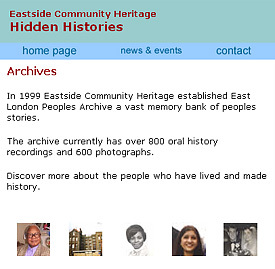 Eastside Community Heritage was established in 1993 as part of the Stratford City Challenge community history project. In 1997 Eastside became an independent charity. Over the years Eastside has worked on numerous projects documenting the lives of ‘ordinary’ people from and who live in East London.